Chicago, IL: Manav Seva Mandir located at 101 S. Church Road, Bensenville , IL celebrated Mahashivaratri with Vedic tradition on Sunday, February 19, 2012. 16 couple participated in Mahashivaratri Puja. 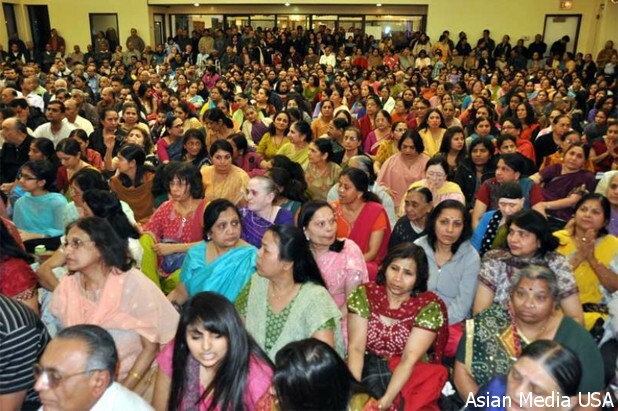 This sacred evening was attended by over 800 devotees witness the special evening Puja ceremony. Two hrs long program was full of deviational activities such as Stuties, Shlokas and Shive Dhoon. Monday February 20, 2012 approximate 450 devotees visited to Manav Seva Mandir for Mahashivaratri puja. The Hindu festival of Mahashivaratri is celebrated on the 14th day of the dark fortnight of the Magh month, February 20th of this year and is dedicated to Lord Shiva. Since the Shivalinga or lingam contains both Shiva and Shakti energy, it generates considerable heat. To prevent its adverse effects, an arrangement of a continuous flow of water is maintained on the lingam. The flowing stream of water is similar to an embodied soul in search of self-realization. If one chants continuously like the flowing stream of water; one eventually is able to progress beyond the barrier of time and attain God consciousness. In observance of Mahashivaratri, we encourage all Hindus to chant ‘Om Namah Shivay’ in an endeavour towards a closer spiritual union between us and the God principle through regular spiritual practice. Lord Shiva is the supreme soul who liberates our soul from the cycle of death and rebirth. The Shiva devotees observe fast during the day as well as the holy night. The Lord not only removes all their obstacles but also showers happiness and joy. Shiva is the ocean of knowledge who leads humankind from the darkness to light. God himself says I come to re-establish the true religion when it is defamed on earth. Puja ceremony was distributed into four section. Prahars, Brahmas, Pratah-Mdhyahn and Sandhya. Learned Priest Dr. C. L. Shastri explained the importance of all these four section of Puja. Importance of participating in Pratah Puja makes the life happy of the participant, Brahma Puja makes the life pious, Pratah-Mdhyahn Puja is that whoever takes part sincerely, it carries no sin and Sandhya Puja relates to Sun and Moon and slowly give fruit to the Lord Shiva devotees. In all there were 16 Hosts to the entire deliberations and 11 Hosts for Arti.1st.Arti was performed at about 7-00 p.m. lighting 108 lamps all together. Bhajans in beautiful manner also were sung on the occasion. After first Puja was performed, there was break for Prasad to all the devotees, who thronged in large numbers. Devotees enjoyed delicious Prasad delivered by Jay Hind restaurant. In Prasad-there was Sukibhaji (Dry Potato & vegetable), Curd, Chevda, Badampak (Almond) and Fruit, which were served along with Thandai as substitute to Bhang. This was merrily enjoyed by one and all. Volunteers and Board of Trustees did excellent job to manage large crowed during this event.